How to Find Compatible Laptop Power Adapter or Charger? Home » Hardware » How to Find Compatible Laptop Power Adapter or Charger? 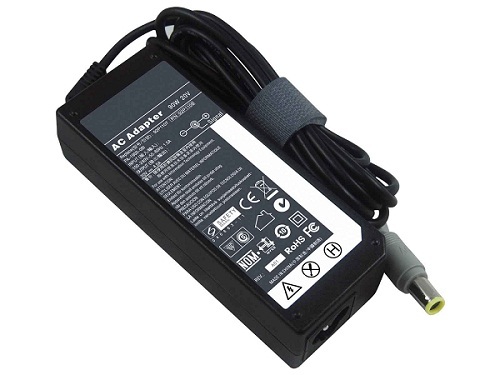 Laptop Power Adapter or Charger is one of the most important things for your laptop. A Laptop Adapter does two things for your laptop, Firstly you can use your laptop running on AC / Mains power and secondly it charges the battery of your laptop. There can be times when your laptop adapter/charger might get blown off or damaged and becomes unusable, which can be due to improper voltage, power surge, faulty components etc. In this situation you may become helpless as you are unable to charge the battery of your laptop or use it with AC power. The only thing you can do here is to buy a new laptop adapter/charger for your laptop but it is not easy as you may think. If your laptop model is new and the same charger is available with the manufacturer then it is good but what if the original charger / adapter is not available from the manufacturer or the company. This can be due because of outdated laptop model or non-availability of the adapter. In this situation what you can do is to find a compatible power adapter for your laptop by carefully following the things that I have mentioned below, because if you plugged in any wrong adapter in your laptop then it can permanently damage your laptop. Here are some important parameters to take into account when buying a compatible laptop adapter / charger. All Laptops have different pin sockets for power. Also power adapters do comes with different pin sizes, so first thing is to make sure that the power adapter pin matches the laptop power pin socket. Here are some different pin types shown in the picture. There are two parameters required to find out the pin size in connector for a power adapter. The first is the outer diameter of the pin and the second one is the inner diameter of the pin. Both are measured in mm and you can measure it with the help of a good precision scale. 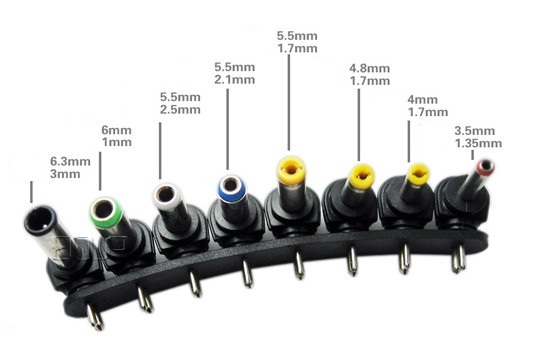 In the image below you have a connector of pin size of 5.5mm & 2.5mm. Here 5.5mm is the outer diameter and 2.5mm is the inner diameter of the pin. Input voltage is the voltage supplied to your power adapter. In India usually it is 100-240V~. So make sure the adapter you are buying is having this value. Input voltage is always in AC (Alternating Current). Voltage is measured in Volts (V). Output voltage is the voltage supplied by the power adapter and it is always in DC (Direct Current). Make sure that the output voltage matches the output voltage specified for the particular laptop model. It is most important thing that should be taking care of, which is the current and it is measured in Amperes (A). You should see that the current (A) of the compatible power adapter matches the current required by the laptop. This you can consult with your laptop manual or look at the value that is specified in your old or damaged original power adapter. This value should not be varied a little bit otherwise you might end up frying your laptop components. P = 19 x 3.42 = 64.98 = 65 W (approx.) which is same as shown in the picture above. Note: There are some universal laptop power adapters or chargers also available in which you can change the voltage and ampere accordingly with the help of a knob. I do not recommend them and should also avoid them at any cost. You only need to match the output voltage for the adapter. If your existing laptop charger is 19volts and 3.3amps and you have a charger that can output 19v and 10 amps, you can use that too! Whatever current the laptop requires, it will draw only that. But if the charger output is 22 volt and 3.3amps, that would fry the system. In reality, most chargers are 19 or 19.5 volts and they can all be used interchangeably. If the current is too low, then the laptop may have some issues due to insufficient power. Also, some cheap chargers may let some AC fluctuations into the DC output. That is what you should be most concerned about. I agree and thanks for your input. May be not a good idea. You have to make sure that the voltage is exactly the same. Pls does color code apply to the adapter pin?